It took a little while, but the Devroom has finally revealed the winners of the Legends 3 easter-egg event. The event tasked Devroom users to design some kind of hidden trick or gag that would appear in Temeo Town. This gag would be executed specifically by kicking, jumping, and/or grabbing and throwing an object. Jumping on certain shop awnings' will propel Mega Man to new heights. Resting at the front of a certain shop is a springy, frog-like object. Kicking it several times will result in the object's demise, leading to a decrease in Mega Man's reputation. Somewhere in Temeo Town, there's an inflatable Reaverbot toy that can be kicked, grabbed, or thrown. The toy makes funny noises and can sometimes even startle NPCs. 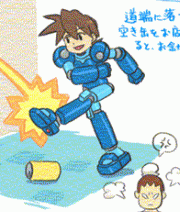 If Mega Man attempts to kick Data, the little fellow will quickly avert his attack by dodging left and right. However, if timed properly, you can actually give him a good punt. Data will counter with a body-slam. Kicking Data too much will darken Mega Man's armor, and Data will refuse to replenish your health for five minutes. If Mega Man gets hit by a car, the driver may actually stop and check to see if he's alright. Depending on your response, you may be reimbursed with Zenny or health-related items. Conversely, Mega Man may be asked to pay a repair fee for the potentially damaged vehicle. A Servbot will task Mega Man with locating lost "Bonne Fan Mail." These letters are hidden throughout town, and require a variety of tricks to locate. Returning the letters unopened to their rightful owner yields a 100 Zenny, or you can read the enclosed message(s) just for kicks and get no reward. You can read up on all the winners, runner ups and honorable mentions at the Devroom. There's A LOT, but each deserves a read. Congratulations to all the winners! If you didn't win, don't fret; there's always another Devroom contest around the corner! So these Easter Eggs are made to be hidden.... and then Announced to the whole gaming world on these eggs? Wouldn't that cancel out the whole, I dunno, hidden and secret part? Oh wow, the "letters" one was a good idea. Kinda like the mail in Paper Mario. Top notch kudos to whoever made that one. Hmmm, may be reading into it too much, but the design in the picture looks like option B for Volnutt new look mixed with the knees and shoes of option A. Think they already decided on his new look? Couple of those don't really sound new. The inflatable reaverbot one is my favorite. @algar: What you don't see is the other shot of Megaman smiling while the lady behind him has that murderous eye look to her. Its on TMMN's front page, and its a placeholder for when the easter egg contest began. As such, this is using the look from Legends 1, so the design contest going on right now is NOT DECIDED. Woohoo, I won! My idea was not to kick Data or he won't heal you for five minutes. I'm so overjoyed I won! The car one's my favorite, hahah.